Il peut être difficile de s’arrêter et d’apprécier les images et les sons du parc national de Fiordland lorsque vous faites de la randonnée ou du VTT. Cette croisière facile le matin prend les paquets de randonnée, la transpiration et la respiration lourde de l'équation. Naviguez le long du lac Te Anau dans un élégant voilier des années 1930 et admirez la vue sur les imposantes Alpes du Sud depuis le lac. Retournez à Te Anau à l'heure du déjeuner, laissant beaucoup de temps pour d'autres activités. We loved this morning cruise. Upon arrival to the boat we were very pleased to find that the four of us were the only passengers on the tour. The boat was lovely and of course we had plenty of space to move around. Even though the weather was raining on and off, there are a lot of space inside the cabin. After a cruise across the lake we docked at a small dock and took a 30 minute hike to a hidden lake called appropriately enough, Hidden Lake. The walk was beautiful and we learned quite a bit about the native flora and fauna. Once back on the boat we were treated to a delicious morning tea which included tea or coffee and an assortment of pastries both savory and sweet. 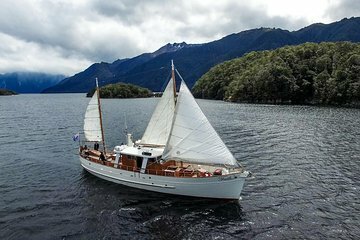 On the way back to Te Anau, the sails were hoisted and we were able to sail home. All in all it was a lovely trip and we would do it again.